DUE TO THE SKULL'S ANATOMICAL COMPLEXITY, THE ANATOMY OF THE SKULL HAS IT'S OWN PAGE. ​- click the button to go to the SKULL ANATOMY PAGE. VIRTUAL FLASH CARDS! Click on the image to control the slide show. You may also download a PDF. Beware, it is 96 slides long! 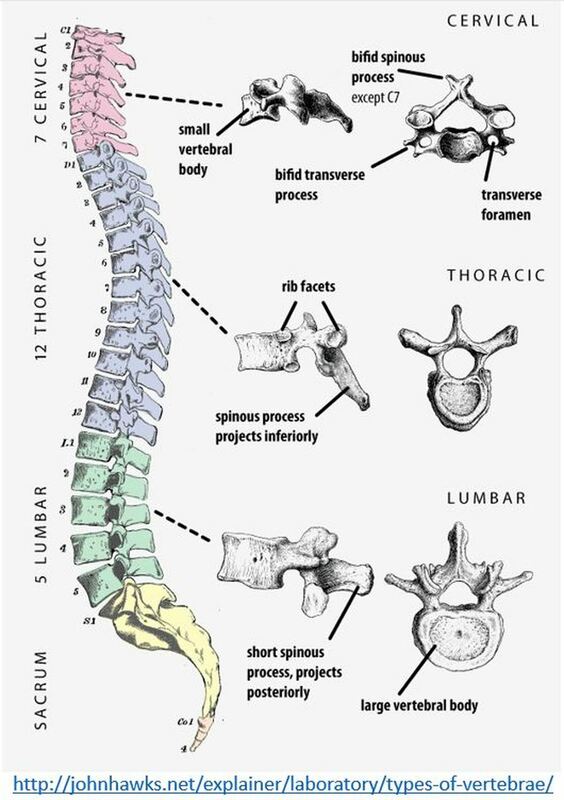 All of these are on the vertebral column and vertebrae. THIS IS A PDF VERSION OF THE VIRTUAL FLASHCARDS BELOW. Your spine is made up of vertebrae, which protects your valuable spinal column and allows for twisting and bending of the torso (trunk). All of the somatic sensory signals from your body to your brain travel from the sensory receptor, through the peripheral nervous system to the spinal cord, then up to the brain. All of the signals from your brain for conscious muscle control, travel from the brain through the spinal column, then to the peripheral nervous system to your muscles. 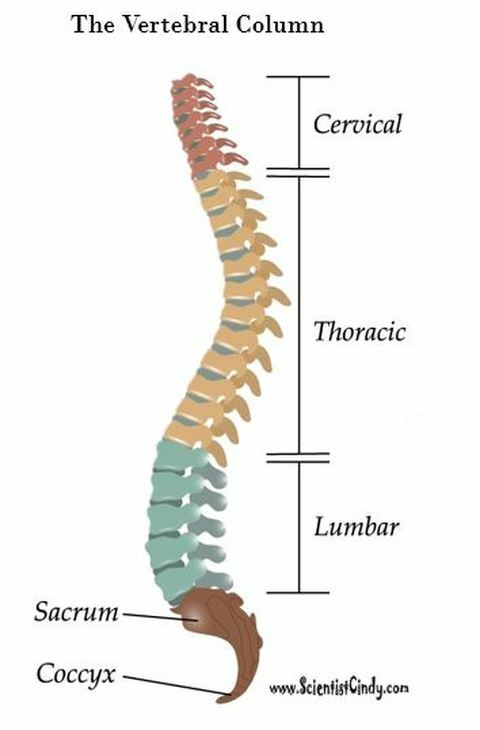 If the spinal column gets destroyed (by being cut or crushed or destroyed by disease), the person will be paralyzed from the level of the injury down! In addition, they will have no feeling below the injury point. Of course there are many cases in which the destruction is not complete and the person may have some sensory or muscular function. After a spinal injury, the spinal cord swells. The spinal cavity (part of the dorsal cavity) is filled with cerebral-spinal fluid (or cerebrospinal fluid) and there is no room for swelling. This causes compression of the nerves of the spinal cord. It is possible that some function may return after the swelling dissipates. Also, in some cases, the nerves can be retrained (using physical therapy) to find new pathways that circumvent the damaged area. 4 fused coccygeal vertebrae that form the coccyx (tail bone). ARTICULATING PROCESS - (articulation means joint). This is where the vertebrae are forming joints. number 1 at the top (superior) end of the vertebral column (spine). 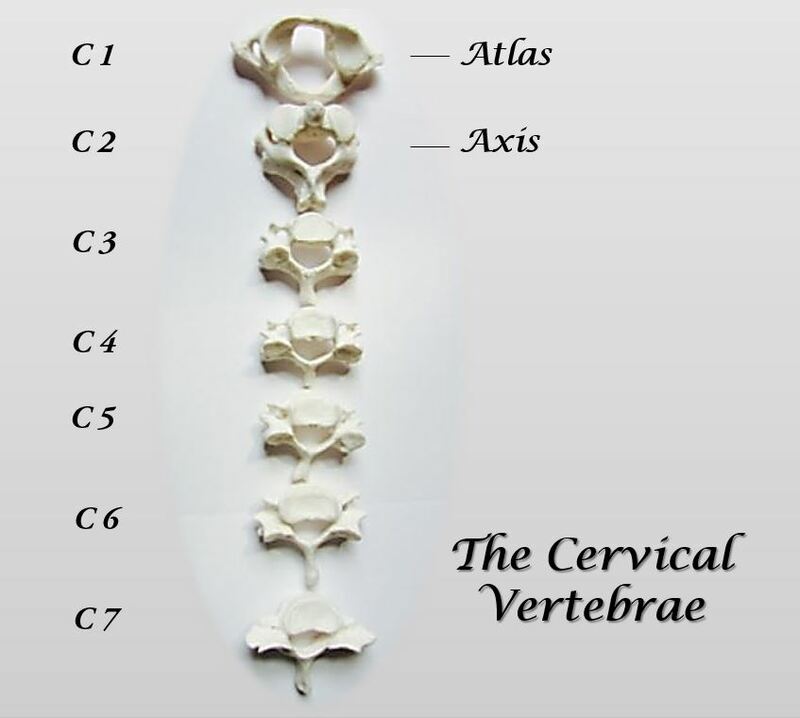 The 1st and 2nd cervical vertebrae have unique features and they are given special names. ​C1 is called "The Atlas" and C2 is called "The Axis". For practical exams, you will be expected to identify not only the specific structures of individual vertebrae, but you will need to identify what level of the spine (the vertebral column) an unarticulated vertebra is from. The cervical vertebrae are the only vertebrae that contain the transverse foramen. The transverse foramen is a hole within the area of the transverse process that functions as a passageway for the vertebral artery and vein. The vertebral foramen is a large opening at the center of the vertebra that the spinal cord passes through. 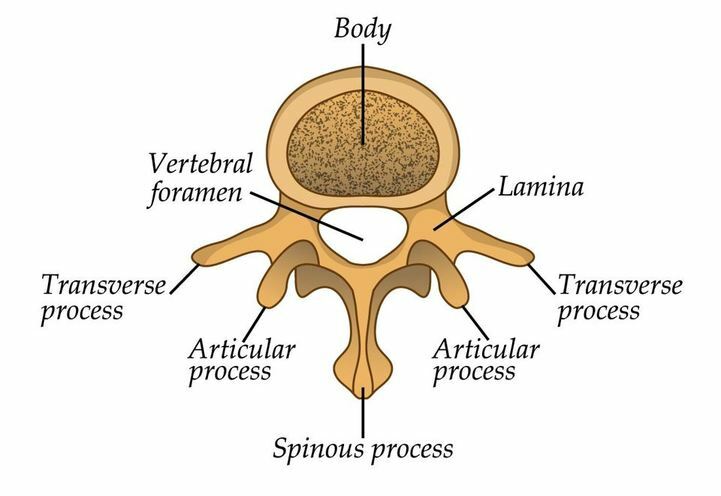 The spinous process is a narrow posterior projection from the junction of the two laminae. It is an attachment point for ligaments and muscles that move the head and neck. This is the portion of the spine you can see through the skin in some people. (Ridges you can feel running down your back). This process proceeds dorsally. Articulate process - Each bone has 2 superior articulate processes and 2 inferior. These are articulation points that connect the vertebra to the vertebrae lying superiorly and inferiorly. Lamina - flat wing-like surface between spinous and transverse process. 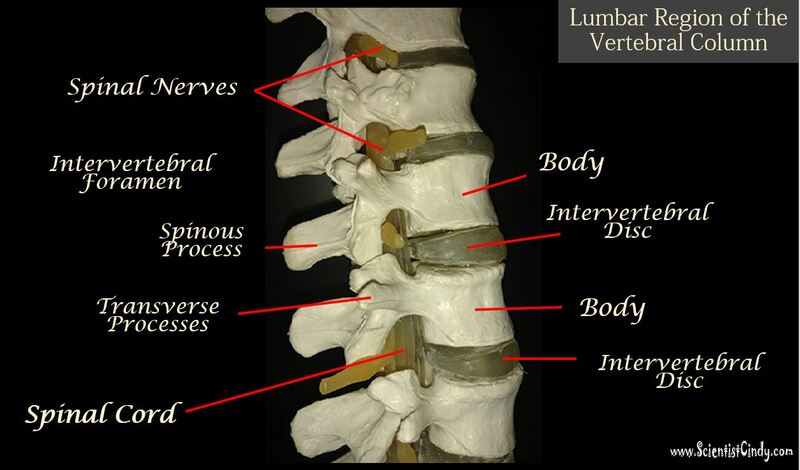 ​The body of the vertebra acts as a surface for the intervertebral (or vertebral) discs. The transverse process is a small extension that projects laterally from the body and acts as an attachment site for muscles. are out to the side of the vertebra (laterally). 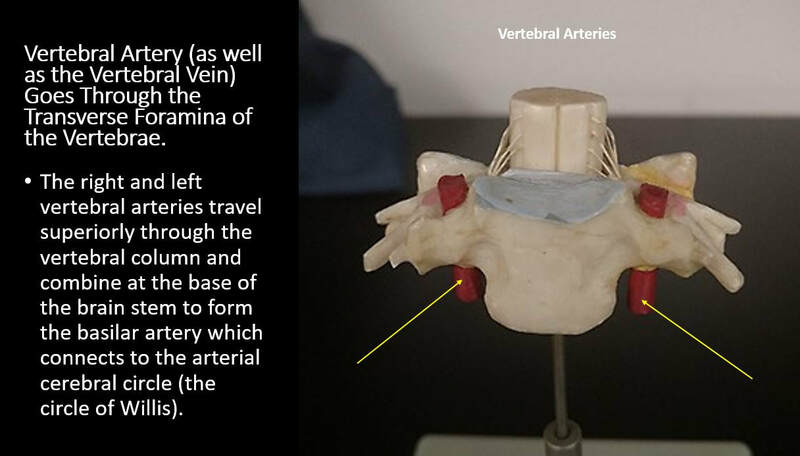 The intervertebral foramen is the passageway for the spinal nerve roots to leave the spinal cord. This structure is not a hole in the bone, like the vertebral foramen or the transverse foramen. Instead, this hole is created when the vertebrae are articulated with one another. The spinal cord travels inferiorly through the vertebral foramina of the vertebrae. The spinal cord gives rise to a bundle of spinal nerves at each level of the vertebrae. 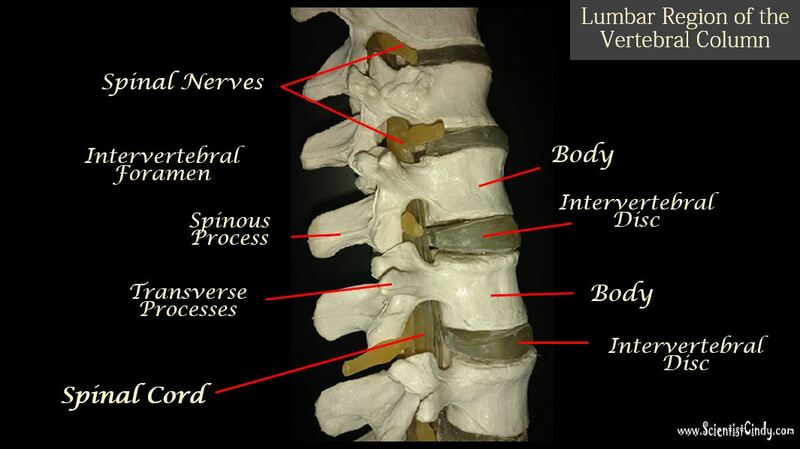 These nerves travel from the spinal cord to various targets through the intervertebral foramina (plural for foramen). In addition, nerves carrying sensory information from the periphery will enter the vertebral column through the intervertebral foramina and join with the spinal cord on their way to the brain. 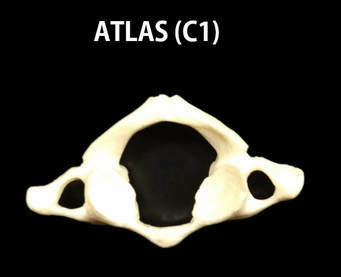 The ATLAS is the ONLY VERTEBRA that does NOT have a BODY! This is the feature you should look for to identify this bone! The Atlas articulates with the occipital condyles that are structures on the posterior region of the occipital bone (part of the skull). "Atlas" from Greek mythology that held the "weight of the world" on his shoulders. In a somewhat similar manner, the atlas of your spine supports the head. (globe). 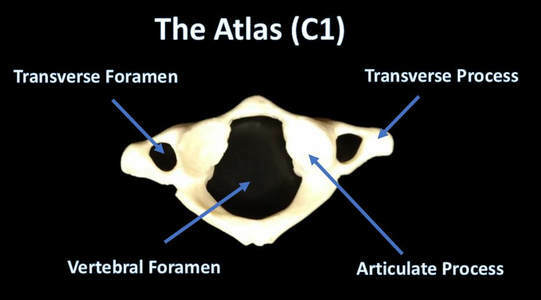 The atlas is the only vertebra that does NOT have a body region. 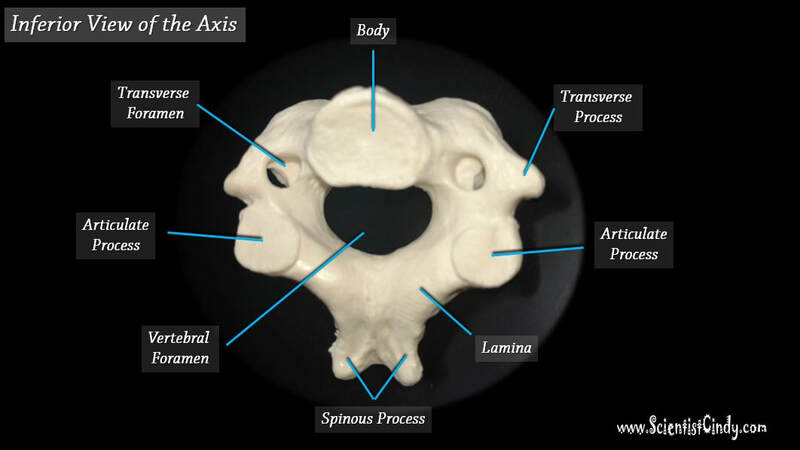 The AXIS (C2) is the 2nd cervical vertebra. It has a noticeable phallic protrusion called the Dens or the Odontoid Process, which no other vertebra has. This is the area you should look for to help you identify this bone. 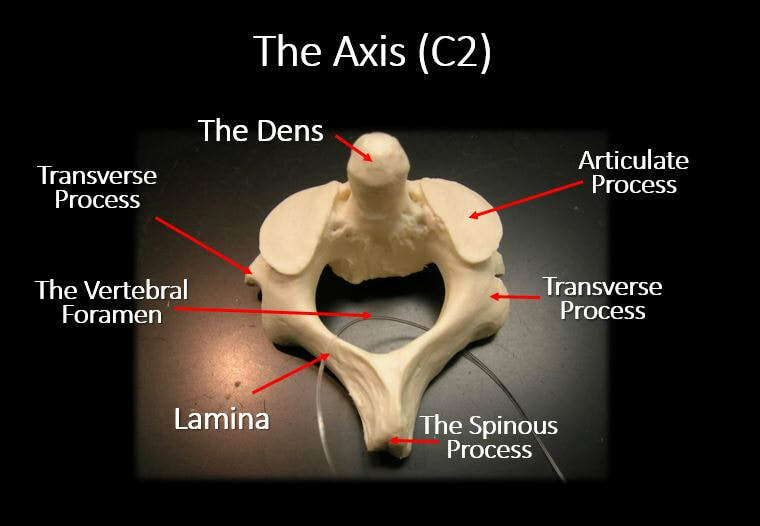 ​The atlas (C1) and the axis (C2) together form the joint that connects the skull to the spine. In order to identify the cervical vertebra, you will need looks for the holes; the transverse foramen. 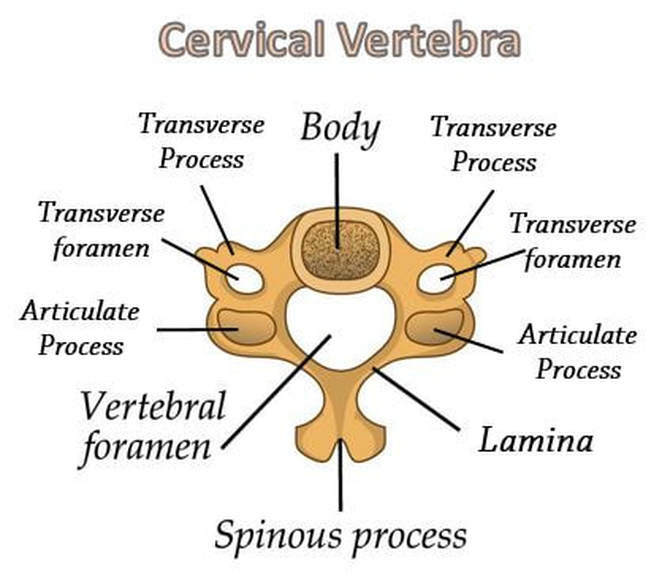 Cervical vertebrae are the only vertebrae that have these structures. 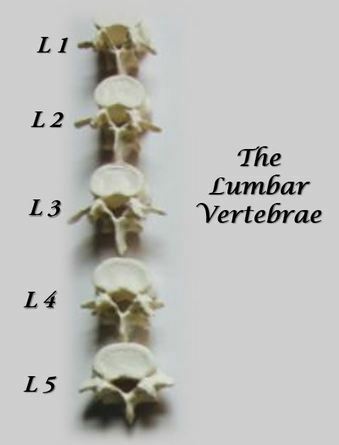 The vertebral column has 12 thoracic vertebrae. Each of these vertebra articulate with the ribs. The point of articulation on the thoracic vertebrae, occurs at specialized structures that look like a thin patch of super glue, called the demifacets. Demifacets are only found in thoracic vertebrae. 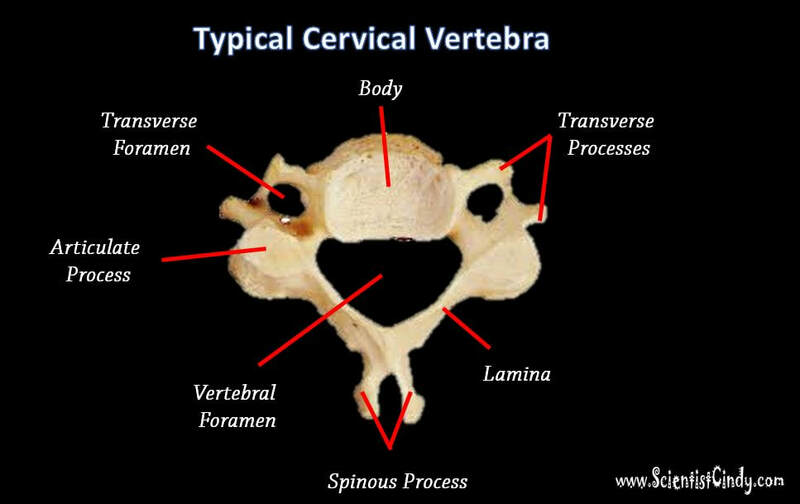 Unlike the cervical vertebrae, the thoracic vertebra DO NOT have Transverse Foramina. You may recall that the transverse foramina were the two openings; one on each of the transverse processes in the typical cervical vertebrae. 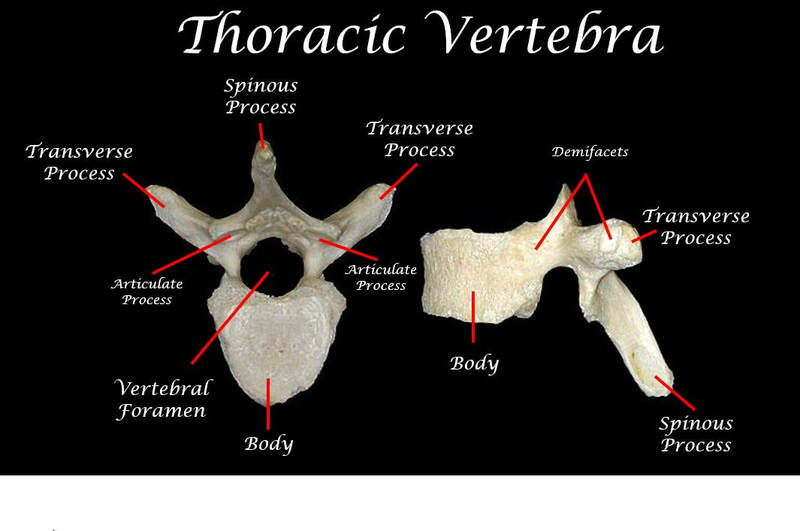 Also, each thoracic vertebra has two small specialized structures (or bone markings) called the demifacets that act as articulation points for the ribs. 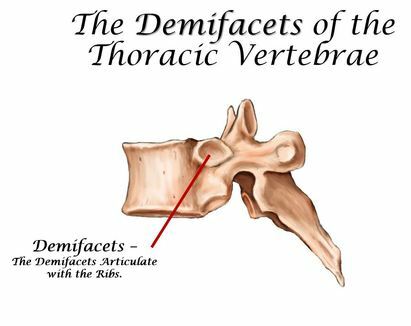 The demifacets are only found in the thoracic vertebra and is one of the ways you can distinguish a thoracic vetebra from the cervical or the lumber vertebrae. The demifacets will be discussed further in a later section. 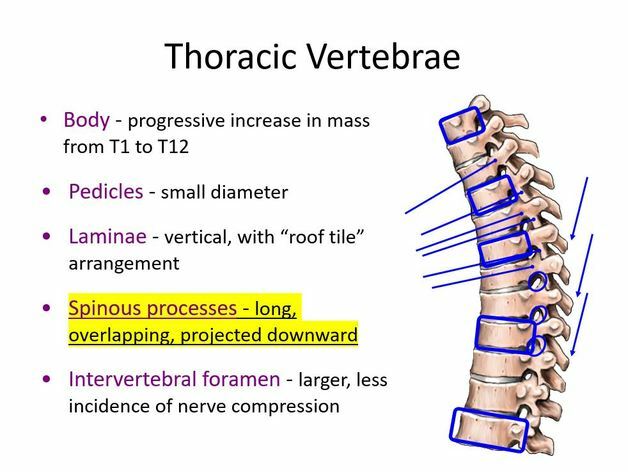 The other structures of the thoracic vertebrae are common to vertebrae at the other levels, but will be defined here again, just for completeness. 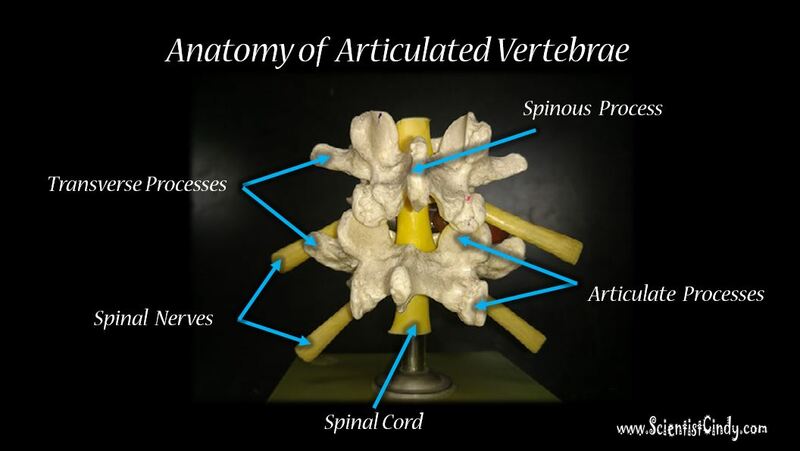 The Body of the vertebra acts as a surface for the intervertebral (or vertebral) discs. The Intervertebral Foramen is the passageway for the spinal nerve roots to leave the spinal cord. The thoracic vertebrae all have structure (or bone marking) located laterally on each side, called the demifacets. The demifacets of the thoracic vertebrae are articulation points for the ribs. All 12 of the thoracic vertebrae connect to the ribs, so all 12 thoracic vertebrae will have a set of demifacets. It almost looks like an area of superglue. ​Articulate Processes - Each bone has 2 superior articulate processes and 2 inferior. The articulate processes of the lumbar vertebrae are very pronounced and help to distinguish it from vertebrae from other areas. The spinous process is the portion of the spine you can see in some people (or the "ridges" you can feel running down your back). In the lumbar region these are "squared off" instead of "pointy". 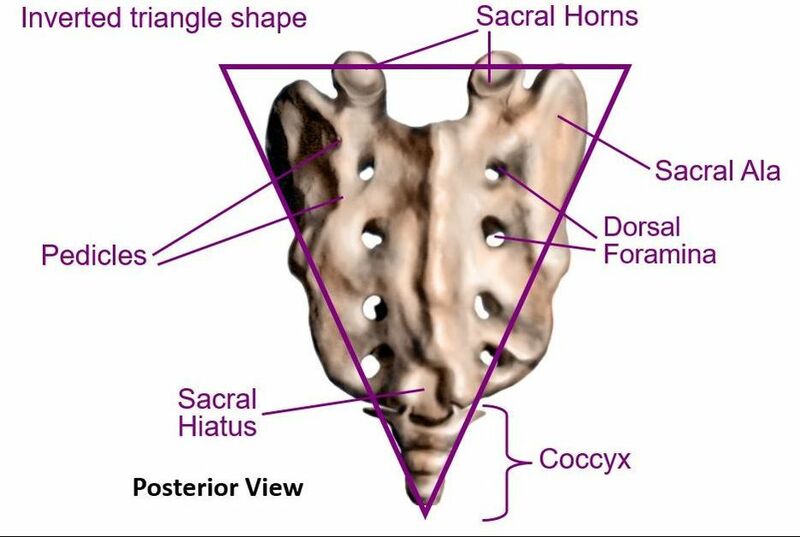 The sacrum is easy to spot. It is made up of either four or five fused vertebrae with holes for the spinal nerve to pass. One of its jobs is to transmit the weight of your body from the spine down into the two halves of the pelvis, which then take it through the legs into the feet and eventually into the ground. ​ The very last part of the spine is the coccyx (tailbone). The word coccyx comes from the Greek word for "cuckoo bird". The coccyx got this name, because it sort of looks like a bird’s beak. 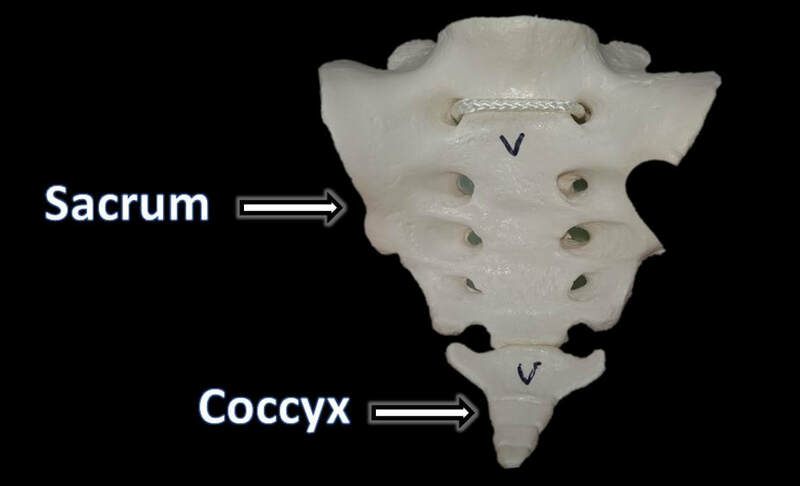 The coccyx is made up of approximately four remnant vertebrae fused together. When placed in alignment with the sacrum, it simply hooks onto the end of the sacrum and continues the curve pattern set by the sacrum. For the practical exam, the vertebrae will be sitting by themselves (not articulated). 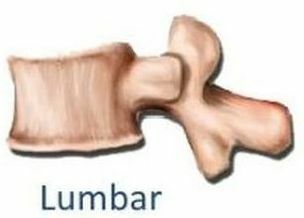 You will need to be able to identify the LEVEL (the Region of the Vertebral Column) that the vertebra is from as well as the structures (bone markings) of that vertebra. The sacrum and the coccyx are easy to identify, so we will leave those out of this discussion. 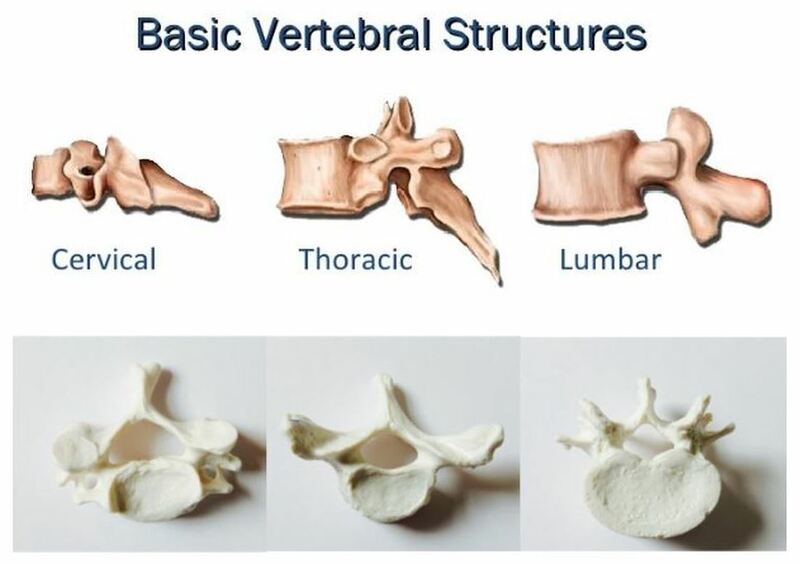 You need to be able to tell the differences between the vertebrae that come from the Cervical Level (​or Region) of the Vertebral Column, the Thoracic Level (or Region) of the Vertebral Column and the Lumbar Level (or Region) of the Vertebral Column.